Let’s look into my crystal ball. Has the Good Witch TV show been cancelled or renewed for a fourth season on Hallmark Channel? The television vulture is watching all the latest cancellation and renewal news, so this page is the place to track the status of Good Witch season four. Bookmark it, or subscribe for the latest updates. Remember, the television vulture is watching your shows. Are you? 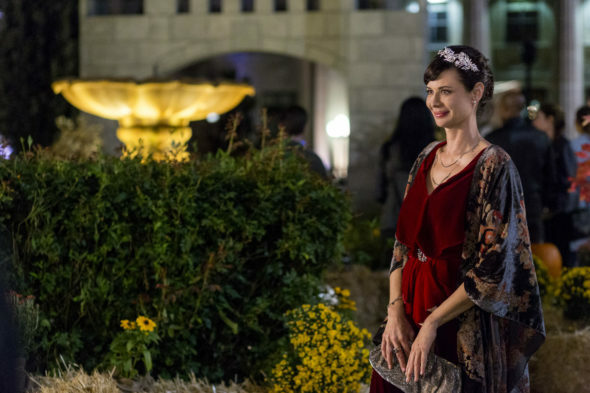 Airing on Hallmark Channel, the Good Witch TV series revolves around a good-hearted enchantress, Cassie Nightingale (Catherine Bell), and her family and friends in the town of Middleton. It seems Cassie’s teenaged daughter, Grace Russell (Bailee Madison), shares her mother’s powers, as well. The series also features the talents of James Denton, Catherine Disher, Noah Cappe, and Peter MacNeill. The third season of Good Witch averaged a 0.24 rating in the 18-49 demographic and 2.15 million viewers. Compared to season two, that’s down by 5% in the demo and down by 3% in viewers. Learn how Good Witch stacks up against the other Hallmark Channel TV shows. On July 27, 2017, Good Witch was renewed for a fourth season with a start date TBD. Stay tuned for further updates. Last season, this fantasy dramedy was Hallmark Channel’s top performing show in terms of both the coveted 18-49 year old viewer demo and as far as total audience size is concerned. The ratings for Good Witch have dropped a bit but, I still expect it will be renewed for a fourth season. 7/27/17 update: Hallmark has renewed Good Witch for a fourth season. Details here. TV show ratings are still important. Follow Good Witch’s weekly ups and downs. What do you think? Are you glad that the Good Witch TV show has been renewed for a fourth season? How would you feel if Hallmark Channel had cancelled this TV show, instead? My wife and I just started watching The Good Witch, I was never into Soap Opera’s but this series is the best down to earth storylines that take us both away into the life of Middleton. Please renew and continue this beautiful series. I absolutely love escaping into Cassie’s world of Middleton. The characters are wonderful and I love the storylines. We love this show and look forward to every viewing! It’s the perfect family show. It sends the perfect message and a program like that is very hard to find these days. Please renew it for many years to come! Thank you.